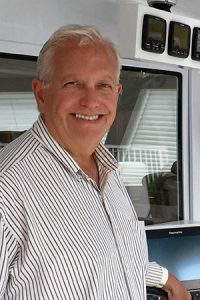 The Multihull Company Hollywood is where TMC Associate Broker George Ottoni is pleased to offer his expertise to assist clients in buyer or selling their multihull. When it comes to buying the boat of your dreams in South Florida, it’s important to have someone who understands you, your goals, and the most important aspects of your yacht purchase. Our TMC office in Hollywood, FL is right in the heart of the world’s largest yacht markets and perfectly suited to assist in the purchase or sale of your boat. Situated between Miami, the business capital of Latin America and the Caribbean, and Fort Lauderdale, home to the world’s largest concentration of marine services and catamarans for sale, George is always happy to assist boat owners with on site logistics and preview vessels for clients prior to travelling down to personally inspect. For George, sailboats and powerboats have been his true passion since he was a child. Even throughout his working career in his previous life as an engineer which involved jet engine design and aircraft integration, George was always looking for the right opportunity with his real passion – boats! Now, having joined the TMC team, George is able to share that passion and communicate his technical experience to his clients. It is that ability to communicate that expertise that sets George apart as a broker. Whether your native language is English, Español, Português, or Français, George is able to fluently converse with you to discuss your needs. Sharing a common language is essential, not only in a business transaction, but in the relationship building process to find the right “fit” for you and your family. So when you are ready, come down to see what George has reserved to show you. At the end of the day you can sit down and enjoy a Caipirinha together to talk them over. Contact him today for all of your cruising needs.